Floyd Collins is based on the true story of a Kentucky caver who got trapped while exploring Sand Cave, and his ordeal from January 30 to February 16, 1925. The musical Floyd Collins, written by Adam Guettel (music/lyrics) and Tina Landau (book/additional lyrics), was commissioned by the American Music Theater Festival (now the Prince Music Theater), Philadelphia, and premiered by AMTF at Plays & Players in Philadelphia from April 9- 24, 1994. The cast included Jim Morlino as Floyd Collins, Jason Danieley as Homer Collins, Floyd's younger brother, Theresa McCarthy as Nellie Collins, Floyd's sister, and Stephen Lee Anderson as Johnnie Gerald, a role that was subsequently eliminated in favor of incorporating the character into a composite with Homer Collins. The show was subsequently redeveloped at Playwrights Horizons in 1995 in preparation for its New York premiere. Floyd Collins began a limited run at Playwrights Horizons on March 3, 1996. The New York production starred Christopher Innvar as Floyd, and once again, Jason Danieley as Homer, Theresa McCarthy as Nellie, and Martin Moran as Skeets Miller. The cast recording was released on the Nonesuch label in March 1997. 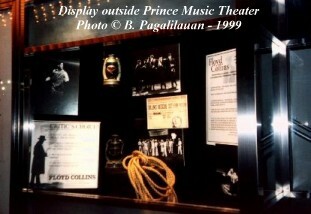 In 1999, a mini-tour production of Floyd Collins, once again helmed by Tina Landau, coproduced by the Old Globe in San Diego (Feb. 13-March 21), Prince Music Theater in Philadelphia (April 2-17), and Goodman in Chicago (April 23-June 5), visited each of those theaters. Revisions were made between Philadelphia and Chicago and implemented after several performances in Chicago. The touring cast starred Romain Frugé as Floyd, Clarke Thorell as Homer, Kim Huber as Nellie, and Guy Adkins as Skeets Miller. The tour received critical acclaim, and won five of Philadelphia's Barrymore Awards for Excellence in Theatre on October 18th: Best Musical, Leading Actor (Romain Frugé), Supporting Actor (Guy Adkins), Director (Tina Landau), and Lighting Design (Scott Zielinski). In addition to those five wins, which was the most of any production, Kim Huber was nominated for Supporting Actress, and Dan Moses Schreier was nominated for Sound Design. With rights available through the Rodgers & Hammerstein Theatre Library, local and regional productions have been mounted across the US, and the show made its London debut at the Bridewell Theatre in the Summer of 1999.